When one thinks of New Jersey they typically think of the city and suburbia. 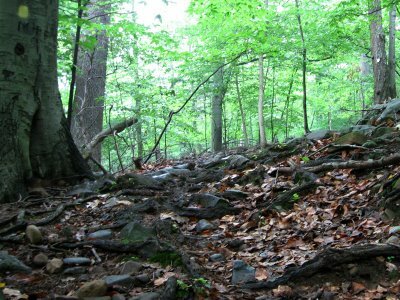 And being just miles from Newark for this race, you might think of crime and other bad things but in the smallish town of Maplewood lies a neat little area called South Mountain Reserve full of nice single and double track trails with rocks, mud and hills. The last time I spent recreating in New Jersey was just out of college helping a friend build a house in Tom's River. But we spent most of the time surfing in some awesome fall waves at the shore, another great asset of NJ. And before that in the early 70's it was night skiing at the Great Gorge/Vernon Valley Ski Area. My start of poaching closed trails and having my lift ticket pulled only to beg management for forgiveness so I could ski again. So when looking for a 50 miler at the last minute close to Vermont and NJ popped up as the closest find, I figured why not. I had some good memories in the past so this could be fun. And Tom, a running client of mine was to be running this as a training run so I figured this would be a great opportunity to see Tom on the trails. So Tuesday night of race week I signed up. Thursday afternoon I decided I better start thinking about the trip to NJ but first I had to run with the Thursday night crew followed with the traditional Italian feast at Mimmo's. Luckily XC skiing was cancelled this night so it allowed a little more free time. But still I didn't get home until close to 10:00 PM. Not much time to pack. So Friday I had to figure out the travel plans. I sort of knew where I was going as I had programmed my car Garmin to where the race was. I quickly came up with a game plan of drink mix and electrolytes, Body Glide, the important stuff. I grabbed some "drop bags" to put my essentials in, set up Hotel F-150, clothing, shoes and dinner for the ride down and the EZ Pass for tolls. The Pass works great on these road trips! So finally by late afternoon on Friday I was ready to hit the roads. Just in time for the snow to kick in too. Luckily it was not too bad and by the time I drove through Albany it was pouring rain and in the upper 30's. And a great time to enjoy a pesto pasta dinner and salad while cruising the NY Thruway. By the time I hit NJ, the rain had stopped. And at the same time, I was entering the congested streets of suburbia. I had traveled this same route about a year ago on the way to a USATF course in Brooklyn but made the left turn on the Lincoln Tunnel. This night I was in new territory on route to the Newark area. I listened to my faithful GPS voice of Samantha as she guided me through the streets. It was getting late on a Friday night and the streets were looking a bit sketchy. I was now in the "hood" and made sure the doors were locked. When I see all the store fronts with metal bars, I start to wonder. I checked and rechecked with Samantha to try to find Maplewood on the map to make sure I was in the right part of the state and finally there it was. Soon I drove by Seton Hall University and from there on I was in another world. Nice upscale homes, no more bars on windows and gated communities. True suburbia. I came upon the entrance to South Mountain and found a park sitting high up on the hill with the NYC sky line lit up in the background. I found the official parking spot for the race by the dog park and set up camp in Hotel F-150. Hotel F-150 is my race rig. It's a Ford F-150 pickup set up as a camper with a cap on the back, sliding windows with screens and an elevated platform for a queen size bed with gear storage below. With so many of the ultra races starting at the pre-dawn hours, it just makes sense and is way easier than staying in a hotel for a few hours the night before a race. Although this night would present some challenges. I finally had my gear and drop bags all organized and ready to go, got good and comfy under my flannel sheets, blankets and down comforter when all of a sudden I was visited by some flashing lights and search lights. I tried to ignore it but "IT" was not going away. Finally I popped open the back of the cap to the amazement of Maplewood's finest as I crawled out. "What are you doing here?" was what I heard and "License and Registration". I tried to explain about the race but he had no idea what it was. After a full check on my background and vehicle he explained to me that the Park was closed and that I was not supposed to be there but as he was leaving said "have a good night". Nice! I was fast asleep in deep sleep, for the moment. By 2:00 AM, the next shift must have been on, more flashing lights and search lights. Here we go again! I think I scared this guy even more as he was looking in the woods for me. I figured if I didn't make myself known, he might call a tow truck to haul my rig away. When I made my presence known, it was the "License and Registration" again. But this time after the interrogation, he told me I had to leave. I stumbled back into the cab and headed towards civilization, clueless as to where I was. I drove around the neighborhoods and after about 20 minutes, finally found a great spot. A huge church parking lot with a somewhat dark corner. Perfect! Back under the covers again, at least for a few more hours. Throughout the night I could hear the wind howling and the truck at times was rocking from the gusts. But for now, it was fine. At 5:30 AM the alarm went off. The clock said 38 degrees inside the cap. Not bad but not easy to get out from the warmth of the down comforter. I had a quick breakfast which consisted of a half a bagel with peanut butter and a banana, got dressed to run and drove off to South Mountain Reserve for the race. Just after 6:00 AM at race headquarters I got my number, chip and figured out where I was, sort of. I still wasn't sure of the race course or of any stats like elevation gain but figured I would follow and learn as it as a 5 loop course' It was also kind of a figure eight so during each 10 mile loop you came back to the start finish area twice. It made it convenient for drop bags and I left some GU Brew drink mix and GU gels, electrolyte pills, extra clothing and an extra pair of shoes just in case. Tom managed to find me and we chatted a bit before the race but it was cold so we both went back to our cars to stay warm until the race start. With about 15 minutes to go I figured I should visit the port-o-let one more time. With only 2, there was a good line up and the line went slow. The RD was shouting out the time before the start and telling those in line for the port-o-let to move a little faster as he was starting the race on time. Finally as he yelled out "75 seconds to go", the door opened and I had my chance to quickly take care of business. With only a few seconds to spare, I was ready to go. There were a lot of runners at the start as this was for both the 50K and the 50 mile but the 50k runners headed out in a different direction to run an extra mile before coming back on course with the 50 milers. I had no idea how many runners were doing the 50 miles and never looked back after the start. Start of the 2012 Febapple Frozen 50. (Pic thanks to Kelly Agnew's collection of photos). I didn't recognize anyone at first until Joshua Finger said hi. 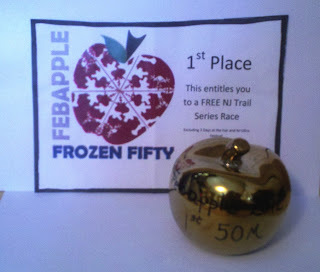 He won the Febapple 50 last year and we had run a couple of years ago at the Finger Lakes 50. He remembered helping me after a fall there but I fall so often I forget about those things. Josh was mainly a road runner in his previous life but has come to the dark side to enjoy the trails and has been doing great. So off we went at a good clip. Soon it was four of us cruising along. Myself, Joshua, Denis Mikhaylov and I think Dante Simone. We would jockey back and forth some but most often it was Denis flying by on the downhills gracefully dancing over rocks and then we would catch up to him on the uphills. It went like that most of the first loop. The course was fun, not what I had expected in New Jersey. It was a nice mix of single and double track trails including some hills and sections of rocks and mud. The rains the day before made for some good wet trails in sections so wet feet was to be the norm for the day. After 4 miles we ran through the start/finish area and I quickly discarded my wind shell and changed my hat from the heavier Headsweats Mid Cap to the Race Cap as I was warming up. The course was marked with white flour on the trail but the rains the night before made it not the easiest to follow, especially on the first lap. At about mile 6 or 7 of the first loop we found ourselves running along without any markings on the trail. At least they had marked a lot of the trail so if you didn't see any marking for a while, you knew to turn back before you were too far gone. Soon we were back on track. The four of us ran the first loop in just under 1:22. Heading out for lap 2, it was three of us, myself, Joshua and Denis. The course was getting muddier as foot traffic was churning up the surface. Not much happened on lap two but Josh and I chatted quite a bit while Denis continued to dance on the downhills and slowly climb on the uphills. On lap three, Josh and I noticed that Denis had faded. After a long downhill we looked back and he was no longer is sight. 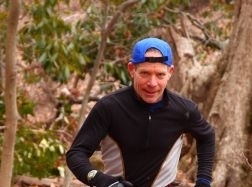 This was his second 50 miler so we figured his lack of experience was taking it's toll on him. After lap 2, I had grabbed a new bottle of my GU Brew but this was a new formula with 2x's the amount of sodium. With all the cramping I do, I figured this was a good time to try it out. I also grabbed a new supply of GU gels, electrolyte pills and off I was again with Josh right there too. The course was getting muddier still and wasn't going to be drying out any time soon but still, it was a great day to run. Temps in the high 30's, no snow or ice on the trail, shorts weather, just the ideal weather to be running in the woods with the extra bonus of no rain or bugs. And it was February! Somewhere around mid lap of lap three, Joshua and I were chatting about the course record and saying it will be broken today. Last year when Josh won, he was running in snow and slush and only 3 runners finished the 50 mile race. So this year with much better conditions and more competition, bettering that time should not be a problem. Soon after that, Josh had faded and I found myself running alone. Josh had a great run at the Rocky Raccoon 100 three weeks earlier so it was only a matter of time until that caught up with him, especially at the pace we ran the first 2 laps. Just before the end of the third lap, I jumped over this log with a large cut out, almost like a bench. I took the approach differently this time and hooked a foot and slipped. I saw myself heading face first for a huge mud hole. The reflexes kicked in and my hands went out to prevent the body slam. Luckily most of the mud was kept to my gloves which I could discard at the end of the lap. So at end of lap 4, the gloves were history, I grabbed a fresh bottle of GU Brew, more GU gels, electrolyte pills and out I went. I had another pair of gloves in my bag but gambled that I wouldn't need them and didn't want to search through my bag for them either. As soon as I started lap 5, the winds picked up and the clouds were rolling in. It was snowing some and seemed to be getting colder. I wished I had gloves on. My hands get cold when its 60 degrees, this would not be fun but it would only be for 10 miles, I could handle that. The wind was definitely getting stronger and one gust was so strong that a large branch came crashing down in the woods next to the trail. I was wishing I had on my wind shell too. With no one to run with and no one in sight, I did back off a bit and even walked up some hills but kept moving forward as it was time to end this. I maneuvered better over the cut out log this time without a mud bath, ran through the last couple hundred yards of water and mud and finished up the day claiming the Golden Apple. Denis ended up second for the day winning the Silver Apple and Kelly Agnew claimed the Bronze Apple. Josh finished up after 40 miles. And the gear for the day, a big change for me. A new ride after many years! 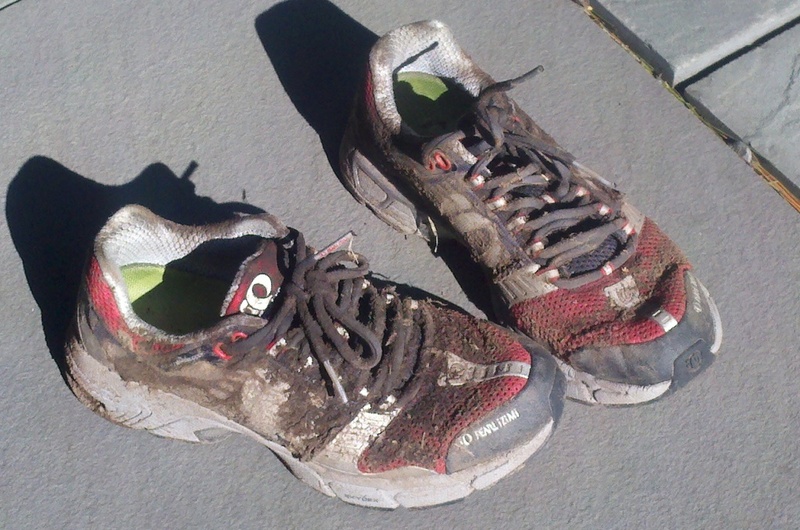 I wore the Pearl Izumi Synco Fuel XC shoe and they were awesome. I only fell once during the day which is good for me but I did manage to kick a few big rocks along the way and the toe bumpers in these shoes were great. They also provided the extra support and cushioning I needed on the rocky sections. Thanks to Kyle at the SkiRack for assisting with this change and thanks to Jeff and Pearl Izumi :) The Headsweats Midcap was great for the cooler start and changing over to the race cap was the perfect transition as the day warmed up. The New Ride from Pearl Izumi with lots of mud. Nutrition, the new GU Brew with 2x's the sodium made for a cramp free day. I noticed after 3 laps that my shirt was spotted with salt even with the cooler temps and it's usually after 35 miles or so when my cramps kick in but not on this day. And I took fewer electrolyte pills than usual. I felt energized throughout the day eating GU gel and the occasional peanut butter and jelly sandwich and bananas. All good! And thanks to RD Rick and Jennifer McNulty for putting on this race. They did a fantastic job with four different races going on throughout the day. Full results can be found here: RESULTS . 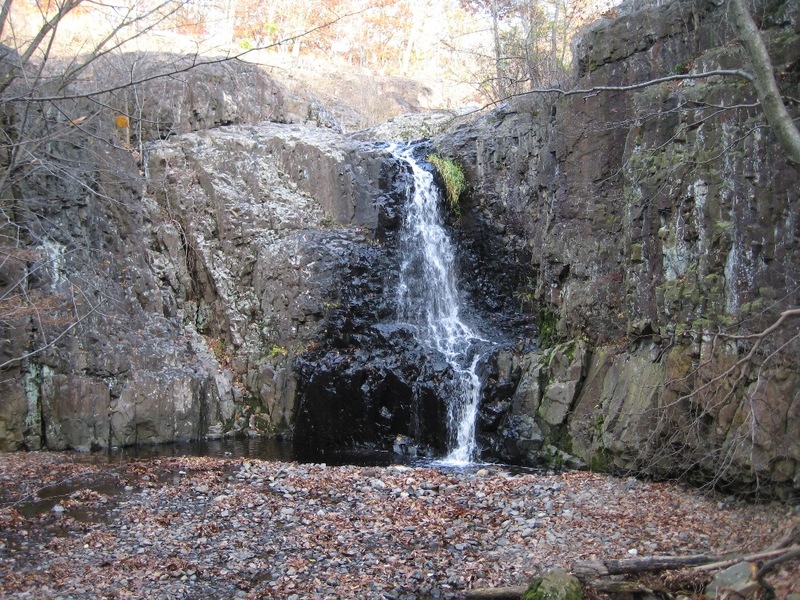 They also host a number of races throughout the year so check out NJ Trail Series. 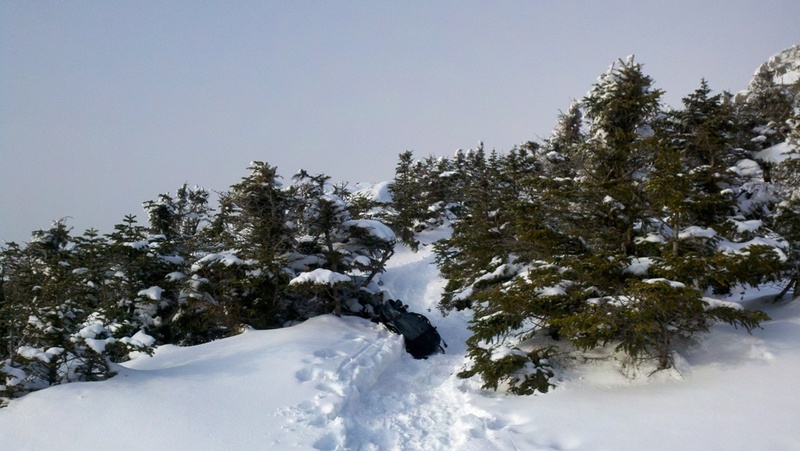 The Mount Mansfield Loop with some extra twists and turns. The Mansfield Loop is a running route I created years ago linking many locations in the Vermont hills together to circle the highest peak in Vermont, Mt. Mansfield at 4395 feet in elevation. 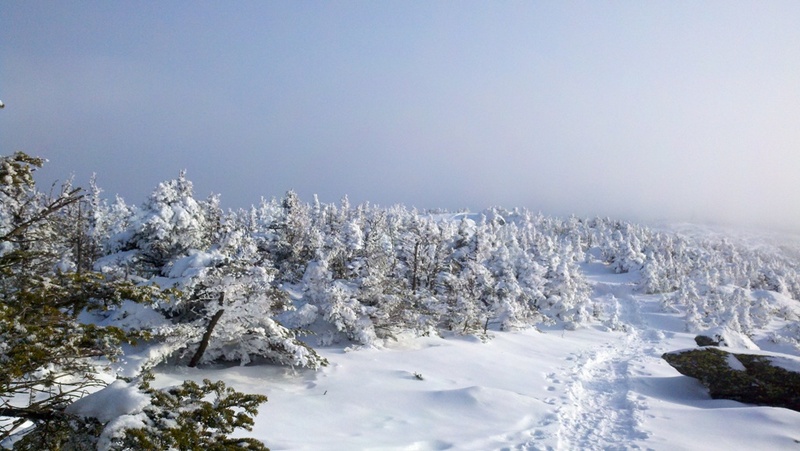 It includes the Long Trail, the Trout Club, The Catamount Trail, Trapps Nordic Center, Mt. Mansfield Touring Center and The Toll Road at Stowe and of course the Chin at the top of Mt. Mansfield. It's not as dramatic as the big mountains out west but it certainly can be a challenge because of the varied terrain and weather conditions. The usual version is about 26 miles but there are other variations as well to make it longer or shorter if desired. Total time on the trail can be 6-7 hours on average. 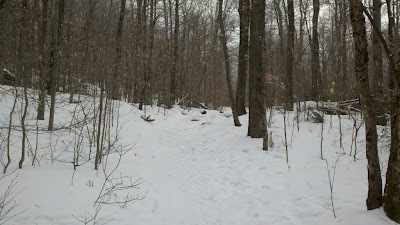 I've run this Loop numerous times in the spring, summer and fall but never in the winter. Usually in the winter I’m skiing but with the lack of significant snow this year and getting extremely bored of running roads and icy trails I thought I would try something different. 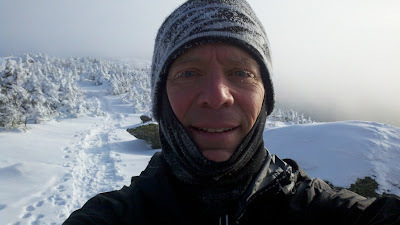 Last weekend I did a run around Camel’s Hump and it was great fun. So this weekend I thought I would venture out a bit longer. I had a late start to the day as usual for me but never got in from running the night before until 6:30 PM. I managed to get in a 20 miler at the end of the day on Friday and got caught in the dark without any reflective wear or headlamp. I finally got home “safely” by running on the railroad tracks and across some frozen meadows to avoid any kind of vehicular traffic. While having some dinner I made the decision to hit Mansfield Saturday morning and was trying to figure out what to pack for the run. With 6 – 7 hours of being on the trail, one of the biggest challenges is to stay dry and warm. With a lot of hills on this route it is common to get quite sweaty right from the start as the first 1½ miles is all up hill. So in preparation, I packed another complete set of clothes along with 3 pair of mittens (my hands always freeze), 2 extra hats and 2 balaclavas of varying thickness. I also brought my GU Brew but had to keep it deep in the pack at temps were looking like 15 degrees and below for the day. And food, snacks to keep me going along with some GU gels for quick energy. Finally I was on the trail by 10:30 AM. The way I figured it, I would have 7 hours of daylight to complete the loop. And if time were running out, I could bypass the summit. I had my headlamp in the car but decided to not bring it as I wanted to be out of the woods by dark. I started off on the Nebraska Notch Trail. It was hard underneath and had a couple inches of snow pack on top which made for great footing and awesome grip with the Kahtoola Microspikes. 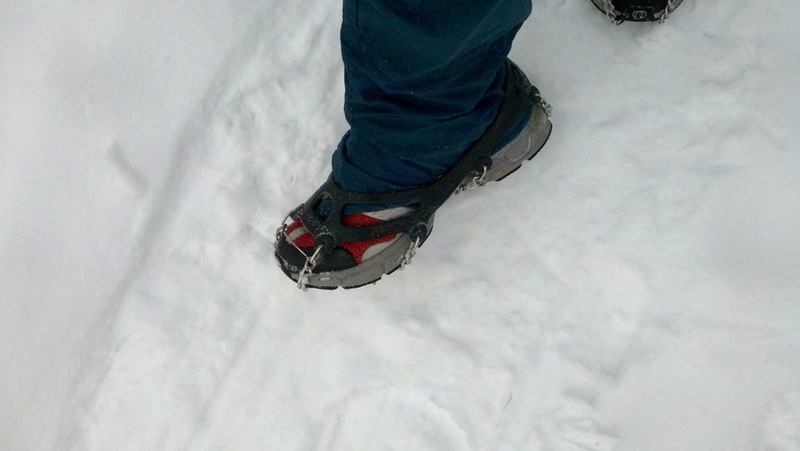 In case I ran into deeper snow and for added insulation I wore XC ski gaiters. I figured it would only help keep snow out of the summer trail shoes. The set up: screw shoes with microspikes and gaiters. The hike up to the Long Trail was up, up and up so I quickly stripped down to a couple of long sleeve techy shirts to stay cool. It was quiet in the woods and I didn't see anyone all the way to Taylor Lodge. I finally saw some signs of life as I went through the Trout Club on the other side of the mountain. The microspikes were working just fine on the uphills and the downhills. For a short section after the entrance to the Trout Club I was on thinly snow covered dirt roads for a mile or two so slipped off the microspikes. I still had on screw shoes which worked fine for the occasional ice but before long I was on deeper snow and ice again cruising along the Catamount Trail heading up to Trapps. Back on with the spikes. Luckily they go on and off very easily. Going through Trapps I was waiting for the trail police to pull me over. Luckily it was Winter Carnival Weekend and a major XC race was going on so I think it kept them away. They don't like us runners going through any time of the year which is too bad. I saw lots of friends at Trapps skiing around including Tom, Binney, Bryce, Sheila, Pascal and some more. The snow looked great for XC skiing. Being higher up than most XC centers they seemed to have a lot more snow than the lower parts of the Valley. On my way to the Mansfield Touring Center I ran into Karen at the crossover from Trapps and had some more social time. So far the weather was perfect, cold but no wind with the occasional glimpse of sunshine to warm you up. Time was still on my side even with all the socializing. I finally arrived at the bottom of the Toll Road at Stowe. I was feeling quite sweaty and usually do a clothing change but with only one change of clothes I decided to wait to have dry clothes to summit the Chin. The Toll Road was busy as I tried to run/hike this 4 1/2 mile section. Usually I complain about cars going up and down the Toll Road, but I will never complain about them again. Skiers and especially out of control snowboarders are way worse! I don’t know how many times I had to jump along the far side of the trail to get out of the way or be run over. It was slow going. I arrived at the top of the new quad lift and took a quick break at the Octagon to get on some dry clothes. While there I ran into another friend, Deedle, who was skiing at Stowe that day. I decided to put on my warmest mitts for the next leg and added hand warmers too as my hands were so frozen I could barely even open the hand warmer package. My one little pinky was in a frozen curved position and was getting in the way when I tried to put my hands in the mitts so I thought the hand warmers would be a special treat. So I was off to the summit, warm and dry, hydrated and some food in the belly, feeling good. The next challenge would be to summit the Chin. Coming up the Toll Road the wind was increasing and I could see the summit engulfed in a fog. Usually that means cold and wind. I planned on going to the Chin unless the winds were cranking. 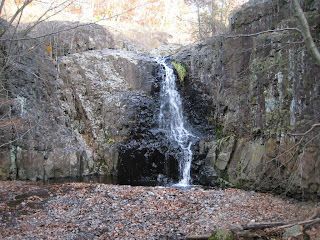 Heading north on the Long Trail proved to be very placid… for the first ¼ mile. Then the wind started to pick up from the Northwest, directly onto the left side of my face. The temperature was probably near zero and within about 5 minutes the whole left side of my nose was numb even with pulling up my balaclava. Out of desperation I thought I would try something new. I found another great use of a hand warmer, a nose warmer! I stuck the hand warmer inside the balaclava on the left side of my nostril and it was incredible! Within a few minutes, that side of my face thawed out and I could breathe again from my left nostril. They need to market these warmers as “Nose Warmers”. They could sell so many more. Anyway, from here to the summit I would continually rotate the warmers from my hands to my nose and it was wonderful! The Leg Breaking Crust was not so wonderful. I quickly discovered that what looked like good firm snow to run on turned out to be hard breakable crust where I would sink up to my knee or shin and be stopped dead in my tracks so carefully I kept going forward. I soon was in the middle of that cold, wind fog and it was cold and windy. With only 1/2 mile to the summit I got lost and disorientated. It looked familiar but was not the Chin. I decided to head what I thought was in an easterly direction and finally came upon a sign barely visible, the West Chin. It's not the first time I've been a little lost on the summit. I've always managed to figure it out after a while. Finally on the Chin, I stopped for a moment of peace and quiet, said my thanks and headed back down on the Long Trail. Too cold and windy for pics. About a mile down the trail the sun popped out, long enough for a quick picture. The summit ridge line with the fog cloud up ahead.